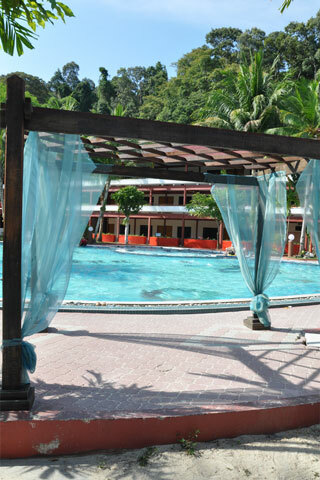 The largest and most prominent resort on Teluk Dalam beachfront, and one of only two places on either island with a swimming pool, the Arwana is the most typically resort-style hotel we saw other than Perhentian Island Resort. It boasts both a typical resort complex surrounding the off-beach swimming pool and a series of two-floor, largely glass-fronted beachfront rooms running along the beach to the west of reception. All 120 rooms include ensuite hot water baths, air-con, television and adjacent balconies. In addition to the on-site restaurant option, they have sauna and massage rooms, a game room, WiFi in the lobby and karaoke. Accommodation is available in room-only and accommodation package versions -- which is the better deal will depend on your interests. The resort tends to take in large groups over weekends and holiday periods which may put off some travellers, but midweek, this could appeal, especially among those who would prefer to have a swimming pool.